People at the dedication reached out to the ghost bike and one another as they remembered Meng Jin. CAMBRIDGE — Meng Jin came to the Boston area from Shanghai in September, beginning graduate studies in economics at Boston University and a new life in the United States. 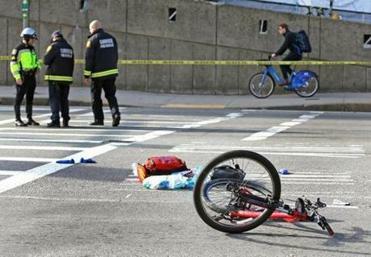 Two months later, the 24-year-old was dead, fatally hit by a dump truck in a busy intersection near the Museum of Science. Deaths like Jin’s could be prevented if governments did more to make streets safer, cycling and pedestrian advocates said at events Sunday remembering Jin and others lost in crashes. “By being present here, we proclaim with our bodies and our bicycles that Meng’s death will not go unnoticed. Tell his friends, tell his family, tell his school and his hometown that Boston will not forget this man,” the Rev. 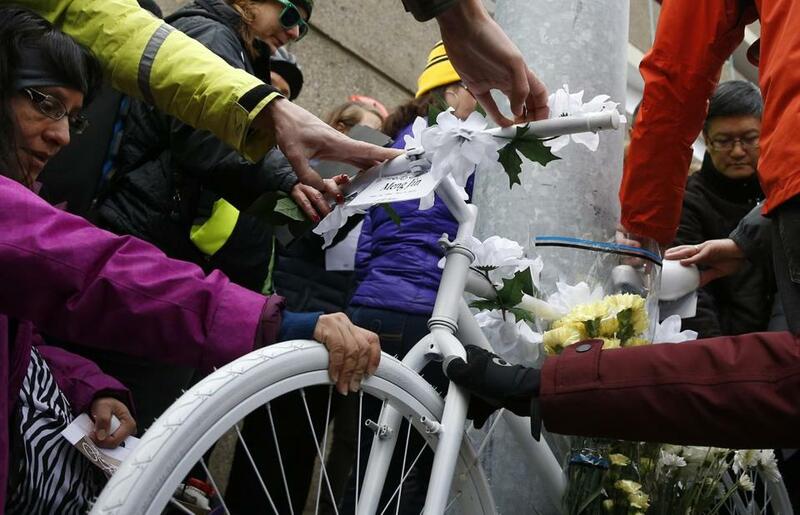 Laura Everett told about 150 mourners as she led a ceremony dedicating a white-painted “ghost bike” at the site where Jin was struck. Everett — herself a cyclist who survived a 2005 crash — said in an interview later that she had spoken with Jin’s loved ones who attended the ceremony, including his godfather, also a graduate student, who lives in Seattle and encouraged Jin to pursue his studies in the United States. Meng Jin was fatally struck by a dump truck Friday morning in Cambridge on the Boston line near the Museum of Science, officials said. Read: Another cyclist is killed. Our streets need to be safer. Now. Others shared the pain of losing loved ones to crashes as they gathered outside the State House later Sunday afternoon to observe the World Day of Remembrance for Road Traffic Victims. The event was hosted by the Massachusetts Vision Zero Coalition, which advocates for measures that make streets safer, with a goal of eliminating traffic injuries and deaths. Chicopee resident Gina Harris, 45, mourned her 20-year-old niece, Gabriella Victoria Lowell, who was struck and killed by a driver in a Worcester crosswalk last June. 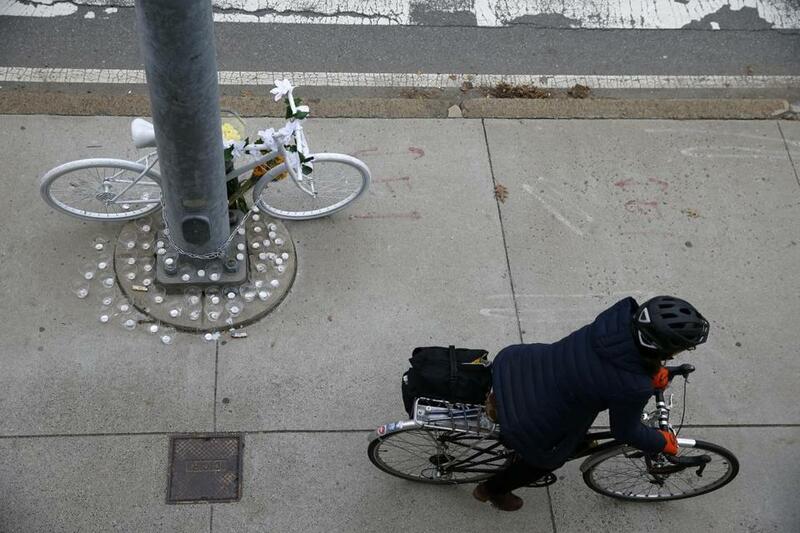 A bicyclist passed the ghost bike placed in memory of Jin near the Museum of Science. Lowell was hit just outside her grandmother’s home, Harris said. Harris called for stronger laws requiring drivers to pay attention and for people to simply put down their cellphones. “That text is not worth someone’s life,” she said. Framingham resident Jillian Kaplan walked up stairs outside the State House to share her story of surviving a 2016 crash. Pollack said her office is working with Cambridge officials, the Museum of Science, and the state Department of Conservation and Recreation, which owns the road where Jin was struck, to make the area safer. From the State House, the mourners marched silently to Boston City Hall. “Our silence is meant to remind decision-makers that we don’t need more words; we need more actions to make our streets safer for everybody,” said Wendy Landman, executive director of WalkBoston. On the bricks outside City Hall, they left thousands of yellow carnations to symbolize those injured and killed in traffic crashes and wrote messages in yellow chalk and spray paint. 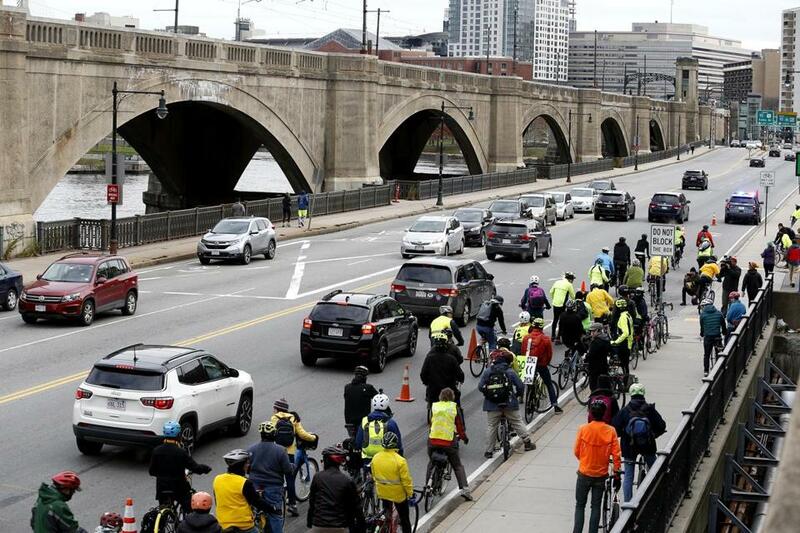 Cyclists made their way from the Museum of Science to the State House on Sunday.